CPL. Ramon Armando Garcia, 54 of Saginaw, died, Monday, August 13, 2018. He was born on August 27, 1963 in Saginaw the son of Ascension R. Garcia Jr. and Reymunda P. (Castanon) Garcia. He graduated from Bridgeport High School class of 1981. 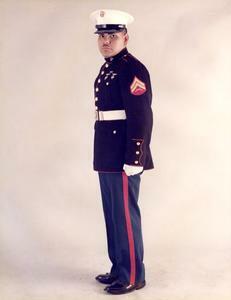 Ramon was a Corporal E-5 in the Marines from 1981 to 1985. He was a faithful follower of God. Ramon loved his three cats and enjoyed Life, family and being with his friends. He was a conversationalist and loved to entertain. Ramon was Free Spirited and believed in Love. He enjoyed the outdoors. His fondest memories were when he lived in Chicago, Illinois and Seattle, Washington. Ramon is survived by his sister, Maria (Jesse) Van Conett, nephews, David and Louis; brother, Sam (Beverly) Garcia and godson, Tony Saucedo. He is preceded in death by his parents, Ascension and Reymunda Garcia Jr., twins niece and nephew, Renee and Javier and grandparents. Memorial mass will be held 11:00 am, Friday, September 14, 2018 at St. Francis of Assisi Parish, St. Anthony of Padua Church, Saginaw. The family will greet friends starting at 10 am. Private burial with Military Honors will be held Great Lakes National Cemetery, Holly. Memorial Contributions may be made to Life Story Funeral Home, 400 W. Hammond Rd., Traverse City, MI 49686 to help with expense (231941.9034. Please visit www.lifestorytc.com to sign the guestbook and share your thoughts and memoires with the family.